A kugel is a pudding. There are sweet and there are savory kugels. It is typical to serve a sweet kugel for Rosh Hashanah (Jewish new year). 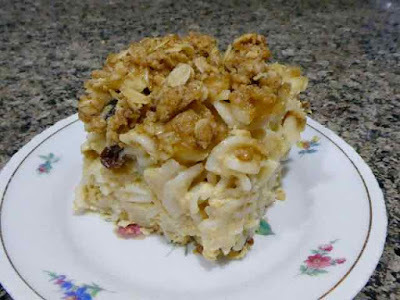 This recipe for a Sweet Apple Cinnamon Kugel is an homage to the tradition of dipping apples in honey in the hope of having a sweet new year. In general I prefer sweet kugels to savory ones. I will serve it with the meal or for dessert. Usually I prefer to use fettuccini type gluten free noodles to replace the typical egg noodles used in this dish. This time when the urge to make it struck I did not want to run to the store, so I used what was in the house, spiral noodles. I am quite happy with how it came out and enjoyed the texture of the spirals. They layered well. I used 16 ounces of noodles instead of the 12 ounces that the recipe called for so the kugel was a little less creamy, but still yummy. I used gala apples (which were on hand) instead of tart apples and I actually preferred them. I forgot to sprinkle the top with cinnamon, if you love cinnamon please remember to use the cinnamon on top. I hope you enjoy this recipe and may you have a good and sweet new year. Shanah Tovah! I used gala apples, but you can use tart apples also. 1) Preheat the oven to 400℉. Line a baking sheet with foil or parchment paper and set aside. Grease a 9 x 13 baking dish or pan with oil and set aside. 2) Set a large pot of salted water on the stove and bring to a boil on high. When the water comes to a rapid boil cook the pasta to desired tenderness. Drain well when done and set aside to cool. It is best to leave the pasta a bit al dente or less done as it will soak up some of the liquid ingredients and become softer. Mushy pasta is not as good for this recipe. 3) Place the raisins in a bowl and cover with boiling water. Allow to soak until plump, about 10-15 minutes, then drain off the liquid and set the bowl of raisins aside. 4) Peel and cut up the apples into bite sized pieces. Place in a bowl and add 2 Tbs. of the sugar. Mix well and then spread out on the prepared baking sheet. 5) Bake for 15 minutes or until tender, remove from oven and allow to cool. 6) Reduce the oven temperature to 350℉. 7) While the apples are baking, add the the cream cheese and 4 Tbs. butter to the bowl of an electric mixer or a large bowl and mix until well blended. 8) Add the sour cream and ⅛ tsp. salt, remaining sugar and cinnamon and mix well. 9) Add the eggs one at a time, mixing well after each addition. 10) Add the raisins, juice and honey and mix well. 11) Add the pasta and apples and stir in with a spoon. 12) Pour the pasta mixture into the prepared 9 x 13 pan. If you like cinnamon sprinkle some cinnamon over the top of the pasta mixture. 13) In a medium bowl add the flours, salt, brown sugar and xanthan gum and mix well. Mix in the rolled oats. 14) Add the cut up pieces of cold butter and use a fork or your fingers to mix the butter into the flour mixture. It will all lump together. This is what happens with gluten free flours. Break up the lump into pieces and sprinkle the crumbs evenly over the top of the pasta mixture in the pan. 15) Bake for 40-50 minutes until he sides start to bubble and the top is lightly browned. 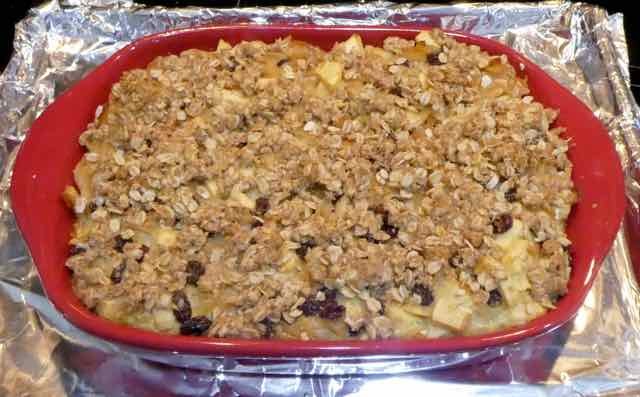 Baked GF Sweet Apple Cinnamon Kugel. 16) Let the kugel cool for an 30-60 minutes before serving to allow it to set. It should come out into nice easy to serve squares after it sets. Serve warm or cold. 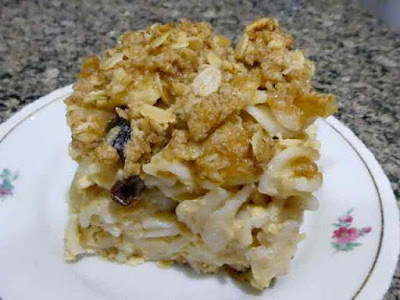 GLUTEN FREE SWEET APPLE CINNAMON NOODLE KUGEL INGREDIENTS 1 cup Raisins 3 medium (I used 6 small to medium) Apples - peeled and cut into bite sized pieces I used gala apples, but you can use tart apples also. 6 Tbs. Sugar - divided 12 ounces Gluten Free Pasta Fettuccini noodles broken into thirds resemble typical egg noodles used in this dish, but I used spirals this time. ( I use Tinyada brand. In this recipe I used the whole bag 16 oz. if you use 12oz the kugel will be creamier than in the photo. ) 8 oz. Cream Cheese 4 Tbs. Unsalted Butter ⅛ tsp. Salt (omit if using salted butter or margarine) 16 oz. Sour Cream 6 large Eggs 1 tsp. Cinnamon ¼ cup Orange or Apple Juice (I used the mango juice I had in the house.) 2 Tbs. Honey ½ cup Gluten Free Old Fashioned Rolled Oats - raw 2 Tbs. Sorghum Flour 2 Tbs. Tapioca Flour 1 Tbs. Chickpea Flour ¼ tsp. Xanthan Gum ⅓ cup Brown Sugar - packed ⅛ tsp. Salt (omit if using salted butter or margarine) 4 Tbs. Unsalted Butter - cut into small pieces DIRECTIONS 1) Preheat the oven to 400℉. Line a baking sheet with foil or parchment paper and set aside. Grease a 9 x 13 baking dish or pan with oil and set aside. 2) Set a large pot of salted water on the stove and bring to a boil on high. When the water comes to a rapid boil cook the pasta to desired tenderness. Drain well when done and set aside to cool. It is best to leave the pasta a bit al dente or less done as it will soak up some of the liquid ingredients and become softer. Mushy pasta is not as good for this recipe. 3) Place the raisins in a bowl and cover with boiling water. Allow to soak until plump, about 10-15 minutes, then drain off the liquid and set the bowl of raisins aside. 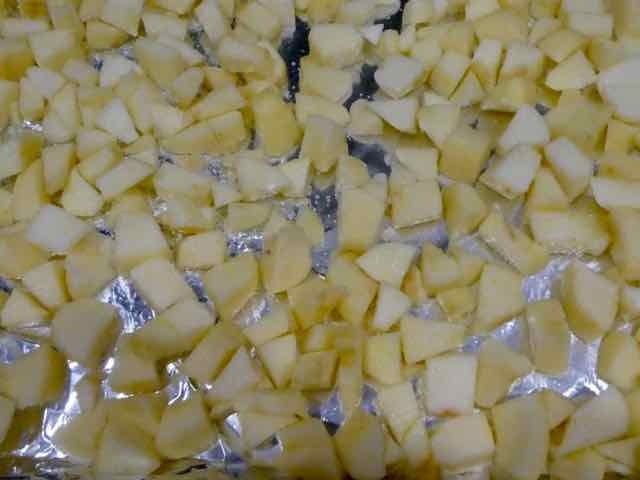 4) Peel and cut up the apples into bite sized pieces. Place in a bowl and add 2 Tbs. of the sugar. Mix well and then spread out on the prepared baking sheet. 5) Bake for 15 minutes or until tender, remove from oven and allow to cool. 6) Reduce the oven temperature to 350℉. 7) While the apples are baking, add the the cream cheese and 4 Tbs. butter to the bowl of an electric mixer or a large bowl and mix until well blended. 8) Add the sour cream and ⅛ tsp. salt, remaining sugar and cinnamon and mix well. 9) Add the eggs one at a time, mixing well after each addition. 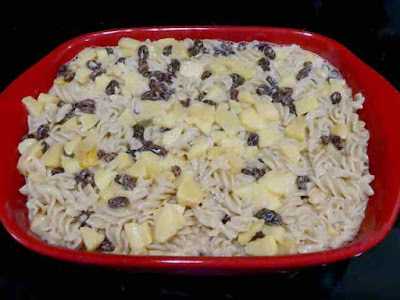 10) Add the raisins, juice and honey and mix well. 11) Add the pasta and apples and stir in with a spoon. 12) Pour the pasta mixture into the prepared 9 x 13 pan. If you like cinnamon sprinkle some cinnamon over the top of the pasta mixture. 13) In a medium bowl add the flours, salt, brown sugar and xanthan gum and mix well. 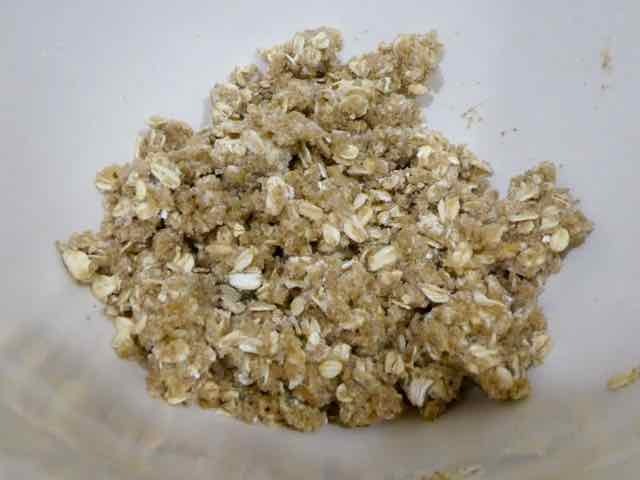 Mix in the rolled oats. 14) Add the cut up pieces of cold butter and use a fork or your fingers to mix the butter into the flour mixture. It will all lump together. This is what happens with gluten free flours. Break up the lump into pieces and sprinkle the crumbs evenly over the top of the pasta mixture in the pan. 15) Bake for 40-50 minutes until he sides start to bubble and the top is lightly browned. 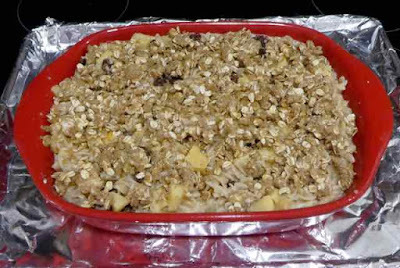 16) Let the kugel cool for an 30-60 minutes before serving to allow it to set. It should come out into nice easy to serve squares after it sets. Serve warm or cold. I am so happy to hear that you found my recipe to be so helpful! I hope you enjoy the Kugel!